Phono Plugs: High quality RCA connectors for the audiophile, enthusiast and professional. Switchcraft 3502ABAU RCA Connectors - Professional Gold Plated Copper Phono Plugs Heavy duty RCA connectors for demanding professional use. 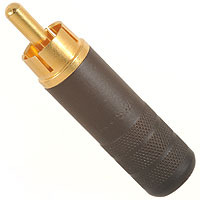 The 3502ABAU RCA gold plated connector is made from high content copper materials for excellent signal transfer. Very strong body with cable clamp and internal insulator. Item code: 3502ABAU. Switchcraft 3502A RCA Connectors - Professional Nickel Plated Copper Phono Plugs Heavy duty RCA connectors for demanding professional use. 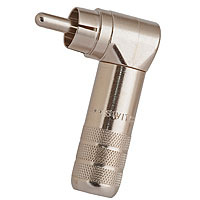 The 3502A RCA connector is made from high content copper materials for excellent signal transfer and nickel plated for durability. Very strong body with cable clamp and internal insulator. Item code: 3502A. Switchcraft 3502RA Professional Right Angle Phono RCA Plugs Heavy duty 90 degree professional quality phono connectors. The Switchcraft 3502RA RCA plug is made from high content copper materials for excellent signal transfer and nickel plated for durability. Very strong body with cable clamp and internal insulator. Item code: 3502RA. 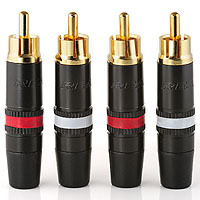 Neutrik-REAN RCA Phono Plugs - Gold Plated Professional Audio Connectors NYS373 Professional audio connectors by Neutrik AG with red and white ID bands. The NYS373 has a durable metal body for demanding professional use. Gold plated finish for excellent contact and supplied with clever internal strain relief chuck. Item code: NYS373RW. 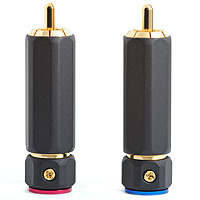 Large Diameter Phono Plugs - Solder Type Gold Plated RCA Audio Connectors Gold plated large diameter phono plugs with red and blue ID bands. These premium quality short bodied RCA connectors have an 8mm cable entry, making them ideal for thick audio cables, such as van den Hul. Item code: PHOPLU01. 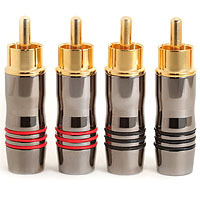 Locking Phono RCA Plugs - High Quality Gold Plated Audio Connectors Premuim quality locking RCA plugs for large diameter audio cable. 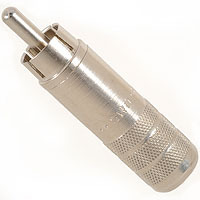 These high quality phono connectors have a rotating barrel to lock the ground ring onto the socket. Satin black handles with red and blue ID bands. Item code: PHOPLU02. 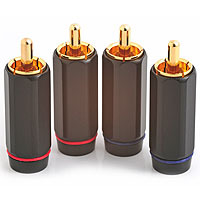 Gold Plated RCA Phono Plugs - High Quality Audio & Video Connectors Gold plated RCA phono plugs with a polished nickel handle and red and black identification rings. High quality RCA connectors for audio cables up to 6mm, with internal solder buckets and cable clamp. We also have a matching range of in line RCA sockets and jack plugs. Item code: PHOPLU03.